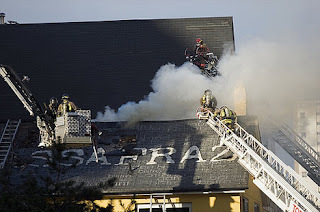 Last week in Toronto, a fire destroyed the celebrity and sycophant infested joint, Sassafraz. Where are all the fabulous people in Toronto going to sip their overpriced martinis now!? Yesterday afternoon as i walked into city centre to meet my friend, Kate, smoke was cascading into Charing Cross and half a dozen fire trucks blocked North Street. i asked someone what was burning to which i was told, "an Indian restaurant on North Street". i felt the colour drain from my face and my stomach fold into itself. My all-time favourite Indian restaurant, Koh-i-Noor, is on North Street. Later, i found out that my favourite Indian place wasn't burning down but another famous curry house, Cafe India. i'm not sure how i would have dealt if it was Koh-i-Noor that was gutted by the fire; i practically moved to this city to be closer to their prawn patia dish (i wish i was joking). 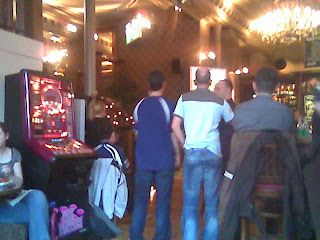 Earlier that afternoon, i watched the Old Firm match with some friends in a pub in the west end. My friend, Laurie, and i arrived just as the doors of the pub were opening. Prior to going inside, i took off my Celtic scarf as football stripes (i.e. jerseys, scarves, etc) are generally not accepted. We went inside, secured a table, and waited for our other friend, Tim, to arrive. As Laurie went to get us some drinks (N.B. COFFEE, MOM! We drank COFFEE), i watched the door for Tim's arrival. Just as Tim walked through the door, i stood up, waved, and yelled, "TIM!!!!!!" Now, most of you Canadians reading this (i.e. my family), probably don't know that "Tim" is sometimes used in Glasgow to refer to someone as Catholic and a Celtic supporter - in a derogatory way. Why exactly? i don't know. Anyway, it wasn't until i sat back down that i realised that i had just stood up in a crowded pub, during an old firm match, and shouted out a sectarian epithet. Notice the guy on the left - he is wearing a Rangers jersey. As far as i'm aware, i didn't think you were allowed to wear club colours but whatever; they actually weren't too bad. Just throughout the afternoon they would shout, "COME ON, RANGERS! BLAAAARGHHHH!"